Our Data Protection Officer is Victoria Heath and you can contact them at V.Heath@liverpool.ac.uk. Places are free but must be booked. Please register here https://goo.gl/forms/tlsPH0jVswRE283M2. Lunch and parking are provided with our compliments. The Phase III Randomised Controlled Trial assessing the impact of postoperative Packing of Perianal Abscess Cavities in now funded and in set-up. Packing changes are very painful for patients that have undergone this procedure. The primary aim of this study is to assess the pain of wound cavity packing changes versus no wound cavity packing at all, as well as the wound cavity healing rate of both techniques as a secondary aim. Other secondary aims will also be assessed. A synopsis of the protocol is attached here. If your hospital is interested in participating in this study, please email ppac2@liverpool.ac.uk for further information. We look forward to hearing from you. Congratulations to General Surgeon, Ms Lyndsay Pearce on being awarded the Royal College of Surgeons of England 'Lady Estelle Wolfson Emerging Learners Fellowship'. Lyndsay is an ST8 General Surgeon and is heavily involved with trainee surgical research in the North West region. She is the Chair of the PPAC2 steering committee and is actively involved in numerous nationwide studies that are on the North West Surgical Trials Centre (NWSTC) portfolio, as well as many clinical audits. She's also a member of the NWSTC Executive Committee with a focus on driving trainee surgical research within the region. Well done Lyndsay, keep up the good work. Researchers from Liverpool have identified a new way to kill certain cancer cells – by starving them of a key nutrient. The finding could lead the way in more personalised treatment of certain cancers. In a paper published in the journal Cell Reports, scientists including Ioannis Poursaitidis and Xiaomeng Wang from the University’s Institute of Translational Medicine and Dr Richard Lamb from Liverpool Hope University, share the results of their investigations into human breast cancer epithelial cells and non-small cell lung cancer cells. The research was funded by Cancer Research UK. The team, which also includes researchers from the USA, discovered that starving cancer cells with a particular faulty gene of the amino acid nutrient cystine generates hydrogen peroxide. The hydrogen peroxide makes the membrane of the cancer cells permeable through a process called “ferroptosis”, allowing water to rush in and swell the cancer cells – which eventually makes them burst. The speed and synchronisation of the cell bursting creates what Dr Lamb calls a ‘wave of destruction’ for the cancer cells. Amino acids are used in every cell of the human body to build the proteins we need to survive. There are more than 20 types of amino acids. The scientists were able to make their discovery after using a technique of creating “gene-edited” cells. They took the genome of a normal cell and changed it by genome editing to generate mutations found in human breast cancer epithelial cells and non small cell lung cancer cells, on which they carried out their tests and compared them to normal cells. Dr Lamb said: “Cancer cells operate very differently to normal cells. They have different metabolisms and their own vulnerabilities. In normal healthy cells, the amino acid cystine helps form healthy skin, hair, bones and connective tissue. “Previous research has shown that overall amino acid abundance may be higher in cancerous tissue, suggesting an increased need for amino acids in some tumours. While testing the effect of drugs that deplete cystine on humans has not yet taken place, Dr Lamb believes that in the long term, these results could pave the way for more targeted cancer treatments. Dr Emma Smith, Cancer Research UK’s science information manager, said: “Figuring out how cancer cells get nutrients, and looking into ways to cut off their supplies is a promising tactic to try and find new treatments that starve cancers. The paper, entitled ‘Oncogene-selective sensitivity to synchronous cell death following modulation of the amino acid nutrient cystine’, can be found using the web link below. A University of Liverpool led clinical trial has shown that 29% of pancreatic cancer patients given a combination of two chemotherapy drugs lived for at least five years compared with 16% who received the one chemotherapy drug. The latest Cancer Research UK figures show that around 9,400 people are diagnosed with pancreatic cancer each year in the UK and around 8,800 people die from the disease each year. The trial involved 732 patients in hospitals across the UK, German, Sweden and France who had undergone surgery to remove their tumour. Around half of patients on the trial received one chemotherapy drug, gemcitabine, and the other half received a combination of chemotherapy drugs, gemcitabine and capecitabine. At this time the standard treatment for patients who have undergone surgery is for them to be administered gemcitabine alone. According to the study twenty-nine per cent of the patients given a combination of the two chemotherapy drugs lived for at least five years compared with only 16 per cent of patients given gemcitabine alone. The study, which has been published in The Lancet, states that this new combination of drugs approach should be the new standard of care for pancreatic cancer patients who have had surgery to remove their tumour. This trial was originally set up in 2008 to address the poor pancreatic cancer survival rates. The results, which were first presented at the American Society of Clinical Oncology (ASCO) in June 2016 but have now been peer-reviewed, show that this treatment plan is predicted to double the number of patients who survive their disease for at least five years. Trial lead, Professor John Neoptolemos at the University of Liverpool’s Institute of Translational Medicine, and Director of the Liverpool Clinical and Cancer Research UK Trials Unit, said: “This is one of the biggest ever breakthroughs prolonging survival for pancreatic cancer patients. When this combination becomes the new standard of care around the world, it will give many patients living with the disease valuable months and even years. Peter Breaden, 67, a retired lab manager and grandfather of five from Merseyside, was diagnosed with pancreatic cancer in April 2010. Following surgery in May 2010 he was to start chemotherapy in the July and was offered the chance to take part in the trial. Peter said: “I know that new drugs and techniques need to be developed so when the doctors told me about the trial, there was no hesitation in my mind – I wanted to get involved. Professor Peter Johnson, Cancer Research UK’s chief clinician, said: “Pancreatic cancer is a notoriously difficult disease to treat. Nearly 10,000 patients are diagnosed each year in the UK so we urgently needs new ways to treat and manage the disease. LIVERPOOL scientists and doctors are set to receive a major cash boost for research into cancer. Leading research charity Cancer Research UK and the National Institute for Health Research (NIHR) plan to invest nearly £1.5m over the next five years into ground-breaking work at the Liverpool Experimental Cancer Medicine Centre (ECMC)*. In Liverpool, the ECMC is a collaboration between The Clatterbridge Cancer Centre NHS Foundation Trust, the Cancer Research UK Liverpool Cancer Trials Unit and scientists and researchers at The University of Liverpool. The December 2016 ECMC newsletter is now available. Professor Richard Shaw’s NIHR EME funded Sodium Valproate for the Epigenetic Reprogramming of High-Risk Oral Epithelial Dysplasia (SAVER) trial, investigating the role of Sodium Valproate in chemoprevention of Oral Squamous Cell Carcinoma (OSCC), had a very successful launch event on 29th November ’16. The day also provided a clinical update opportunity for the management of Oral Epithelial Dysplasis (OED). Presentation topics included the management of OED, Allelic Imbalance and epigenetics in OSCC, Pathology of OED, plus the patients’ perspective in oral premalignancy and the SAVER qualitative sub-study. Presentations and recordings are available below. Cancer Research UK has announced the largest investment to date into its network of Centres across the UK. £190 million has been committed to 13 Cancer Research UK Centres over the next five years. The huge investment will draw together world class research and medical expertise to accelerate advances in research and support clinical trials essential to getting lifesaving treatments to patients. John P. Neoptolemos, MD, PhD, of the University of Liverpool, discusses findings from this international phase III study of adjuvant combination chemotherapy: gemcitabine and capecitabine vs monotherapy gemcitabine in patients with resected pancreatic ductal adenocarcinoma (Abstract LBA4006). Research Nurse, Elisabeth Turner who works on the PANasta trial, from the North West Coast Taskforce of the NIHR Clinical Research Network was shortlisted as a finalist in the Excellence in Cancer Research category of the 2016 RCNi Nurse Awards. The award, sponsored by Cancer Research UK recognises the role that clinical research nurses play in helping to deliver clinical trials. All finalists attended the award ceremony at the Westminster Park Plaza Hotel, Lisa Berry Editor in Cancer Nursing Practice and Anne Croudass Cancer Research UK Lead Research Nurse, who were both part of the award panel have congratulated Elisabeth on being shortlisted in the category where the standard of entries was exceptionally high. The North West Surgical Trials Centre is holding another of it's hugely successful surgical workshops in June and will include inspirational talks from experienced senior trialists, plus surgeons new to research. The afternoon will also provide the opportunity to discuss trial ideas, mechanics of setting-up studies etc. Please see the attached posters for further information and to book your free place. Abstract LBA4006: ESPAC-4: A multicenter, international, open-label randomized controlled phase III trial of adjuvant combination chemotherapy of gemcitabine (GEM) and capecitabine (CAP) versus monotherapy gemcitabine in patients with resected pancreatic ductal adenocarcinoma. for presentation at the 2016 ASCO Annual Meeting. This abstract has also been hand selected to be included in the Best of ASCO® program, which will be held this summer following the ASCO Annual Meeting. The Best of ASCO® is an educational initiative that condenses highlights from ASCO’s Annual Meeting into a two-day program. The purpose of this initiative is to increase global access to cutting-edge science. Abstracts were selected according to specific criteria and reflect research that is relevant and significant in oncology today. In addition to three domestic Best of ASCO® Meetings, there will also be nearly twenty International and Officially Licensed Best of ASCO® Meetings. Professor Neoptolemos presented "The future of adjuvant therapy" at the recent St. Gallen International Gastrointestinal Cancer Conference 2016. To view a webcast of the presentation please click on the link below. Other presentations are also available. Professor Paula Ghaneh has been appointed as a member to the NCRI Upper GI CSG. There are now three members of the LCTU on this group; Professor Paula Ghaneh, Professor Daniel Palmer and Dr Trevor Cox. February 4th is the first World Cancer Day. Professor John Neoptolemos has been appointed as the Clinical Chair of the National Institute for Health and Care Excellence (NICE) committee for Pancreas Cancer. NICE is an independent organisation which is accountable to the Department of Health. The work of NICE is to improve the outcomes for people who use the NHS. Professor Neoptolemos will apply his experience to produce a set of guidance, recommendations, and standards, based on evidence. This helps those who make decisions about health services, plan high quality services for patients. Phil Whelan, Macmillan Nurse and the specialist Pancreatic Cancer nurse for the Pancreatic Unit at The Royal Liverpool Hospital was nominated by his colleagues and patients for the annual nurse appreciation award from Pancreatic Cancer UK. Ten nurses working in pancreatic cancer care from around the country made the short list for the award at the Pancreatic Cancer UK 13th Annual Nurse’s Study Day in October. The award recognising achievements or care or service development in pancreatic cancer. Anna Jewell, acting Director of Operations, Pancreatic Cancer UK, said: “At Pancreatic Cancer UK, we are committed to supporting the role of the clinical nurse specialist and as such we are very keen to show our appreciation for their hard work and dedication. This award focuses on initiatives which result in a better experience for people with pancreatic cancer, ranging from a piece of research to a change in practice which enhanced the patient journey. Phil is pictured receiving his award from Anna Jewell, acting Director of Operations, Pancreatic Cancer UK. Congratulations go to Dr Richard Jackson for completing his PhD. With the support of the Liverpool Cancer Trials Unit, Richard completed his Thesis titled “Some Statistical Methods for the analysis of survival data”. His research focused on efficient methods for design and analyse of Cancer Clinical trials and was conducted part-time whilst working here at the unit. During Southport Flower Show, Dr Bill Greenhalf spoke to Cancer Research UK Supporters at the Cancer Research UK Show Garden, about his research and developments in pancreatic cancer research. The Cancer Research UK Show Garden was designed by Neville Hymus, and won a silver medal at the show. The garden was organised by Alexis Fairclough from Cancer Research UK Legacy, sponsored by Merchant Taylors School, and Moorcrofts Solicitors. Over the four days of the show, the garden attracted a great deal of attention from the public, and was visited by many of our supporters. Southport Fundraising Committee carried out bucket collections, enduring some quite heavy downpours. The Isle of Man Relay For Life 2015 took place 29-30th August. An amazing fifty three teams took part, raising £85,000 for Cancer Research UK. 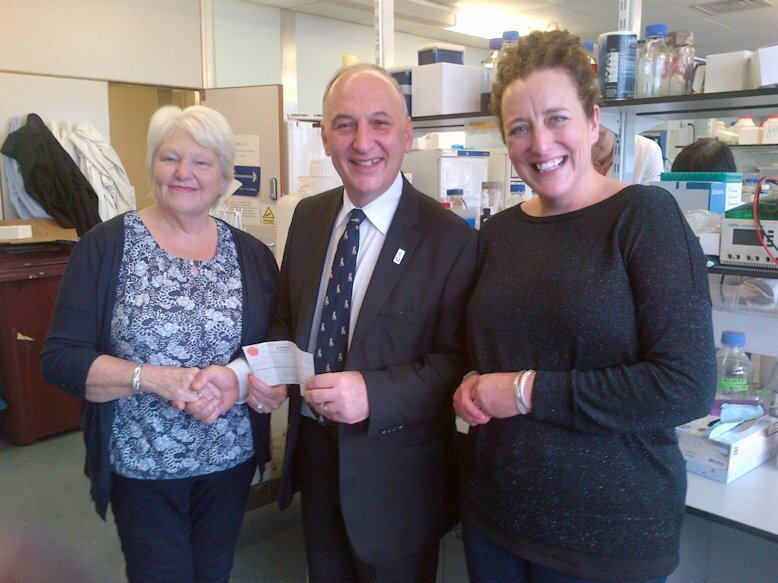 The organising committee lead by Nicola Pitts have raised £250,000 in five years for Cancer Research UK. Teams at relay walk throughout the night, lighting candles of hope during the evening to remember loved ones affected by cancer. Over 90 survivors took part in the opening survivors lap, of honour, followed by a survivors reception. Teams entered, 'Best Tent', 'Best Team Banner' and new for this year, 'Miss Relay'. Relay on the Isle of Man is an amazing community event, bringing together friends and families participating, and is supported by the generosity of many Island based businesses. Urine Test For Early-Stage Pancreatic Cancer Could Help Save Hundreds Of Lives. Liverpool scientists have collaborated with a team at Barts Cancer Institute, Queen Mary University of London to develop a test combining three proteins which could give an early diagnosis of the disease and help separate cancer from chronic pancreatitis which often presents in the same way. The news was highly publicised around the world featuring on prime time BBC and CBS News and other world networks. The Liverpool team led by Professor John Neoptolemos, Dr Eithne Costello and Dr W Greenhalf from the NIHR Liverpool Pancreas Biomedical Research Unit, were critical to the success of the research. The study analysed 488 urine samples, including 192 from patients with pancreatic cancer, 92 from patients with chronic pancreatitis and 87 from healthy people. In addition, they looked at 117 urine samples from patients with diseases of the liver and gall bladder. These samples were used to confirm their findings. The report is published in the on-line version of the journal Clinical Cancer Research and showed that a combination of three proteins gave an early warning of the disease, with more than 90% accuracy. At a recent ceremony in Nanjing China, Professor John P Neoptolemos, The Ellen and Evans Chair of Surgery, was made an Honorary Professor of Nanjing Medical University. Professor Neoptolemos was also made an Honorary Advisor for the Pancreas Centre at Nanjing Medical University. Dr William Greenhalf, Reader and Operational Director of the GCPLabs (LCTU) in Liverpool was made an External Advisor of the Biobank of the Pancreas Centre. In 2015 the world QS ranking for Nanjing University was 162. Nanjing Medical School ranks 56th among the 100 top Chinese universities and was It was one of the first universities in China to offer an English taught Bachelor of Medicine and Bachelor of Surgery (MBBS) programme. Nanjing (meaning Capital of the South) is the central University for Jiangsu Province with a population of 80 million. Up until 1949 it was the old Imperial Capital of China with long cultural history and was one of the Four Great Ancient Capitals of China. The new version of the Portal has been released and is now in use. A help file containing full instructions for the new Portal Home page is available by clicking on the Blue Question Mark icon in the upper right hand corner of that page (See picture). We will be activating the on-line data query review system on a trial-by-trial basis over the next few weeks. We hope you enjoy the new user experience, if you encounter any problems or wish to provide any feedback please contact the system designer James Read at the link below. The LCTU Portal is going to receive an upgrade on 20th June 2015, the update is taking place on a Saturday to minimise any inconvienice caused. This is a major upgrade and all users will be effected, the look and feel of the Portal Home pages has been significantly improved and many new features have been added, all with the intention of improving the communication and feedback between the LCTU and staff working at Sites. You can download the new user guide here LCTU Portal V5 User Guide, it is recommended you do this and familiarise yourself with the new instructions before the update is released. Layout and Menus - The page layout and arrangement of menus has been significantly changed to improve usability and functionality. Login Timeout - The timeout for logins has been removed, your login session will now last as long as you have your browser open. Data Queries - You can now review and answer data queries directly through the Portal. CRF Tracking - Ability to review the CRF Schedule and Tracking Information for Patients. CV & GCP Status - Review and upload site CV and GCP certificates. Delegation Log - Review and confirm Delegation Log information. Document Receipts - Review outstanding document receipts. We apologise for any inconvenience caused as you familiarise yourselves with the new system, but are confident the improvements and extra functionality will make it worthwhile. You can email me (James Read – IT Developer) with any questions you have now and during the next few months on j.read@liv.ac.uk. (Please be patient it may take me some time to work through all your emails). Article on Clinical Trials - North West Tonight, 20/05/2015. "Well I did it! I completed the London Marathon. It was a great experience and one that I will never forget. I cannot thank you all enough for the support you gave me, which made this, and all the training associated with it, so worthwhile. I attach a couple of pictures from the day, for those of you who weren’t there. Read on if you’d like to know more about how it went. I managed to beat my original targets for both time and fundraising, but didn’t quite meet my stretch targets for either. The start was perfect. We were right at the front of one of the three starts, with several of the celebrities – Jensen Button, Chris Evans, James Cracknell, Mark Carney, etc. At about six miles in I saw Paula Radcliffe with her entourage. Throughout, I saw so many friends and colleagues – some several times – but I didn’t manage to see my family until the very end, which saddened me greatly at about miles 9 and 11. The support throughout was astonishing, almost deafening at times. The Cancer Research UK cheering points were immense and were visible from far away, which gave a great boost throughout the run, every two miles. And the live bands, the crowds offering jelly babies, oranges, drinks, you name it, and constantly shouting my name and encouraging me, were simply fantastic. The reception that the Cancer Research UK team organised at the end at the Royal Society was outstanding. All of the runners were made to feel immensely special, not least through a very welcome massage! On time, my original target had been under five hours. But my personal stretch target was 4.30. I managed 4.54, so I’m pretty pleased with that. The first half went really well and I was loving the experience. I reached the half-way point at 2.14, so I was bang on target. But then I made a serious mistake. I took on a Lucozade energy gel at mile 14. Within a few minutes it reacted very badly with my stomach and I had quite severe stomach cramps for the next ten miles, which completely knocked the wind out of my sails. That meant I had to walk in bits and run slowly for the rest. So for me, hitting the wall wasn’t quite a one-off event. It was more like a series of events over a ten mile stretch! My mile spilt times show it perfectly! I finally recovered at about 24.5 miles and was able to run the rest of the way at a decent pace, but by then the damage was done. The great news was that a colleague caught up with me at about 600 metres to go and we ran the rest of it and crossed the finish line together, which was a really nice way to end. Of course, I had had several energy gels before, of several different brands, but I had never had a Lucozade one. Silly me – they always say don’t do anything different on race day! My fundraising has been fantastic, and I cannot thank you all enough. When the going got really tough, knowing how many people had supported me, and how generously, definitely spurred me on and kept me going. I am so grateful to you all. I smashed my original target of £50,000. My current total, including gift aid and pledges, stands at £70,500. So some way short of my stretch target of £100,000, but still an enormous total, thanks to the generosity of you all. Thank you so much. So to answer the obvious question, no I won’t be doing another one. It would be nice to try and hit my 4.30 target time, which I feel I could achieve, just for the personal satisfaction of it. But the time it takes at weekends and the energy it drains over the winter months is more than I can manage again, much as the experience was a fantastic one. I may do some 10ks or even the occasional half marathon. I will certainly carry on running, for fitness if nothing else. Given that a year and a half ago I couldn’t run a mile and now I can consistently do more than 13, I have come a long way and don’t want to lose all of that. It may be easier said than done though!" Alexis Fairclough - Launch of Legacy Liverpool: "Yesterday saw the solicitors launch of “Legacy Liverpool”. A new initiative and legacy campaign led and developed by me to encourage gifts in Wills to local causes across Merseyside and Cheshire. The aim of Legacy Liverpool is to inspire people and encourage the propensity to leave a gift in their Will to one or more of the 16 charities represented. We also want to educate the legal sector to encourage charitable giving when speaking to their clients, and to ask the question when Will writing “Have you thought about leaving a gift in your Will to a charity?” and using Legacy Liverpool as a tool to encourage a gift to their favourite cause. It is my role to ensure CRUK receives as much publicity as possible from this to enable me to get more enquirers to pledgers for CRUK. Legacy Liverpool is a platform, a voice, for legacy giving, and a way to encourage more pledge opportunities for CRUK in my Region. The group is currently made up from 16 charities from across Merseyside and Cheshire and includes National charities all with a local project or presence across Liverpool. I have had a lot of interest however from other charities wishing to join, so this could get even bigger! The campaign also aims to raise awareness for those who are considering leaving a gift in their will about the positive impact these contributions can have on generations to come. A legacy gift, even once family and friends have been taken care of, is often the single largest donation an individual will ever make and Legacy Liverpool want people to consider choosing a local charity which will benefit those in need right here on our doorstep. Yesterday, we launched the event to 39 legal professionals and will writers from across the Region and the event was held at Liverpool Town Hall with an opening speech from the Lord Mayor of Liverpool Cllr Erica Kemp. The Lord Mayor made reference in her speech about her own experiences of Will making and how she wasn’t prompted by her own solicitor about charitable giving in her Will, and she spoke with passion about how she wanted to change this and see Legacy Liverpool thrive in the coming months. She also spoke about how refreshing it was to see charities working together to achieve great things. Her speech was very emotive and to the point and it was an honour to have her talk on behalf of CRUK and Legacy Liverpool. She also made a point of how she can see great things from Legacy Liverpool and that she will hopefully see awards for the initiative in the Voluntary sector and in the City of Liverpool. We also had a presentation from Susanne from Remember a Charity, who also made comment on how well the group had done and how great it was to see this going forward, plus a talk from a legal firm which Sianne organised, that the solicitors attending were attentive to, and Mark Feeny from Brabner’s talk clearly referred to the campaign and to charitable giving in Will making. Thank you Sianne for arranging this with him. Sianne and Alison attended and supported me got a lot out of it both for the FWS with new contacts and Visionaries plus a CPD talk agreed to for a solicitor event in the North West…amazing networking ladies!! To conclude the event, I presented the campaign Legacy Liverpool. I felt so proud to be able to represent CRUK and the group and to see fruition for all the work gone into the campaign and to speak on behalf of the voluntary sector in my City. The solicitors engaged with my presentation and were fully supportive of Legacy Liverpool, and we made some great contacts on the day including a meeting I am arranging with 2 firms about sponsorship of the CRUK Legacy Garden at Southport Flower Show in August. Next steps is we launch this to the public at the end of April! Plans include features in the 50Plus magazine, a bus wrap in the Legacy Liverpool brand, local media press releases, and tomorrow the event will be featured in the Business pages of the Liverpool Echo plus a website with links to the charities involved legacy pages and partnering with FWS solicitors. We have celebrity endorsements of the campaign and quotes from local well known faces such as Ricky Tomlinson and Beth Tweddle, and are working on more celebrity endorsements to help with the campaign as we launch to the general public. We had feedback forms which everyone completed from the firms attending, and the feedback was very positive. We have social media set up for the group so if any of you have a Twitter account please follow and retweet @LegacyLiverpool and let’s get #LegacyLiverpool trending! A great day for CRUK leading a campaign for legacy giving across the sector!" This Report provides an overview of all our activity in this area including our Centre for Drug Development, our Experimental Cancer Medicine Centres, our Clinical Trials Units, our research nurses and the clinical trials supported by our funding committees. The studies included in the catalogue encompass the clinical trials pipeline from the development of new agents, addressing areas of unmet clinical need and developing better treatments with fewer side effects. LCTU staff took part in the Cancer Research UK, World Cancer Day Campaign, 'We will unite'. Wearing unity bands to show support for those we have lost, to fight for those we are battling cancer, celebrate survival and help protect generations ahead. We were fortunate to get our hands on a few of the 250,000 bands, representing unity and collective force, staff shared their support on social media, and donated £45. Thank you! ENTRIES are now being taken for this year's Wirral Race For Life in aid of Cancer Research UK. Organisers hope 3600 women will sign up for the Globe-backed event, held in Birkenhead Park on Sunday, June 28. Trevor leads the Medical Statistics Team at the Liverpool Clinical Trials Unit. The Director of the Liverpool CTU, Professor John Neoptolemos said that everyone was absolutely delighted with the news. “The LCTU is the largest CTU in the North West and one of the largest and best in the UK and is known internationally for the quality of its work. This would not be possible without Trevor and his wonderful team. We are very happy with this excellent personal achievement for Trevor which also represents another important step for the development of the Unit”. Chester City centre is now home to a second Cancer Research UK Shop, located opposite Marks and Spencer’s on Foregate Street. Opening for trading on October 31st, manager Tracy and her team took over £2500 in the first two days trading, beating the recently opened store in Leeds. A local cancer survivor Noah officially opened the store on November 10th with his Mum. Cancer Research UK shops sell a mixture of donated and new goods, one of the University’s two Cancer Research UK donation stations, to collect unwanted goods is in Liverpool Cancer Trial Unit, thank you to everyone who passes on their goods to raise money for pioneering cancer research. The LCTU has been successful in their application to become part of the National Cancer Research Institute (NCRI) Cancer CTU Working Group. Membership of this group is limited to Cancer clinical trials units (CTUs) with an excellent portfolio of multicentre trials and an ongoing commitment to cancer trials. Clinical trials units play a pivotal role in delivering UK research and the NCRI Cancer CTU Working Group will allow the leading cancer CTUs to continue to bring their influence within the wider national cancer infrastructure, without undue additional bureaucracy. Professor John Neoptolemos, Director of the LCTU said “I wish to thank everyone for the outstanding quality of work undertaken conducted by all LCTU staff over the years. The LCTU was started in 1996 in the absence of any CTU activity in Liverpool at that time. Since then the LCTU has grown and our reputation is known nationally and internationally. The award of NCRI membership should not be underestimated: “the threshold for patient number in multicentre trials is comfortably met”. 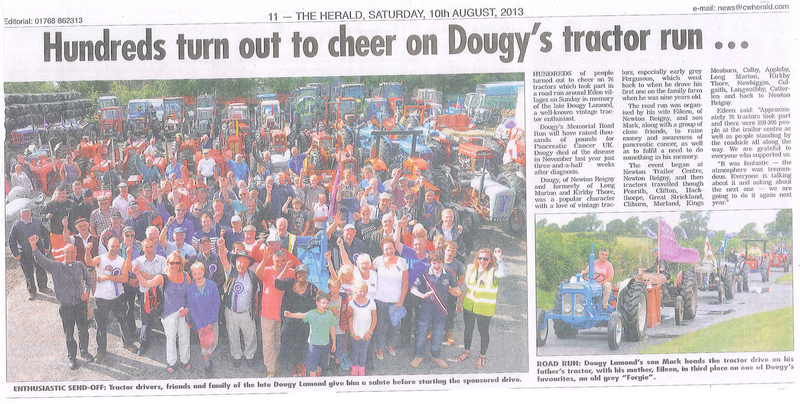 60 tractors were involved in a tractor run in August in memory of Dougy Lamond. 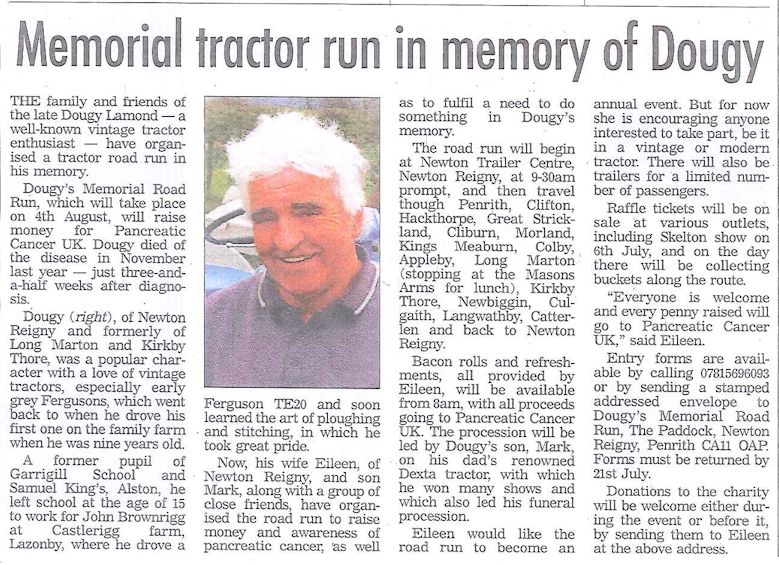 Dougy was diagnosed with pancreatic cancer just 3 and a half weeks before he passed away at the age of 66. Dougy was a tractor expert and entusiast. 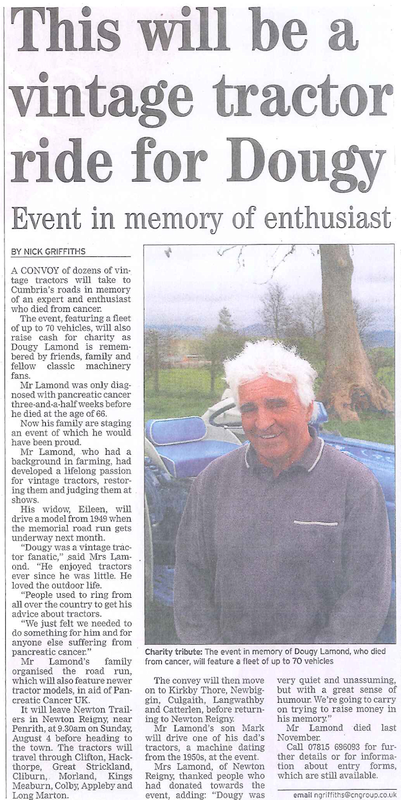 This was the second event, the first was held in August 2013 and raised £6,700. This years event has raised over £3,500 so far.100's of people turned out for the tractor run, which saw over 60 tractors drive 52 miles through 20 Eden communities..
Staff at the Liverpool Cancer Trials Unit braved 'The Liverpool Wire' to raise money for Cancer Research UK. The wire spans nearly 1000 ft. from a launch height of almost 100 ft.
Click here to see a video of one of our staff on the wire! Francis 'Franny' Benali, an ex Southampton FC player, visited both Goodison Park, and Anfield stadiums on Saturday morning as part of his 1000 mile run between all 20 Premiership clubs in aid of Cancer Research UK. Franny's is supported on his challenge by his family. Benali's Big Run started their challenge in Newcastle, Franny took in newly promoted Burnley FC on Friday September 29th, Everton FC and Liverpool FC very early in the drizzly rain on Sarturday, before heading off to Manchester. The run will end in Southampton on September 13th, Franny hopes to reach the £1 million mark with his fundraising effort. On the evening of July 26th Cancer Research UK supporter and fundraiser Jude Harrison, organised a Charity Ball and Auction at The Holiday Inn Runcorn. Jude has set herself a target of raising £10,000 this year for Cancer Research UK, and has held a fundraising event every month in 2014 to reach this. Following dinner, entertainment was provided by the Retrobeats, along with the auction. Jude is dedicated to fundraising in memory of her mother, who died in 2011. Mr Tilly had a tough start in life. Abandoned and unwanted, he was down on his luck. But the tide turned when he was adopted by the owners of a Scottish tea shop. Now Mr Tilly has a new life and a new mission – to help others. Mr Tilly, the helpful pug dog, is the protagonist in children’s books written by Scottish actress Noreen Boswell. While Noreen is busy creating adventures for Mr Tilly, many miles away in Liverpool a scientist called John is planning his next big research project. More formally known as Professor John Neoptolemos, he’s a world-leading pancreatic cancer expert. John and Noreen don’t know each other, although their lives are more closely linked than they realise. But to understand how and why we need to go back to the 1980s – when John was about to rock the world of pancreatic cancer research, and Noreen was a happy newlywed. 1989 was a year of change. Chinese students were taking a stand at Tiananmen Square and the Berlin wall came tumbling down. Noreen had been married for a year and was thinking about starting a family. And a group of young scientists had an idea that would change the way we think about pancreatic cancer forever. Back then, overall cancer survival rates were much lower than they are today: around a third of patients could expect to survive for 10 years or more, compared to half today. But for pancreatic cancer, survival rates were trailing well behind the average – only one in 10 made it past the first year after being diagnosed. For some pancreatic cancer patients, surgery was the best form of treatment, but success rates were very low. Little research was being undertaken and there was a general sense of futility about improving the outlook for these patients. An injection of hope was desperately needed, and that’s where John came in. He rallied together scientists from across Europe to tackle the problem head on. As he explains: “The situation needed some ‘young bloods’ who had nothing to lose. We knew something needed to change and we believed we could do it”. John had an idea to test whether extra treatment after surgery could help improve survival for people with pancreatic cancer. But he wouldn’t give up, and after some initial tests he convinced Cancer Research UK to fund a groundbreaking clinical trial called ESPAC-1. Surgery plus chemoradiotherapy followed by a full course of chemotherapy. John and his colleagues thought that chemotherapy and chemoradiotherapy might improve survival individually, but that together they might have an even bigger effect. This was clearly vital information, and that part of the trial stopped as soon as the evidence was clear. But perhaps the biggest finding was yet to come. John and his colleagues found that patients receiving a full course of chemotherapy after surgery had a 15 per cent higher chance of surviving five years or more than those who did not receive it. Not only that, but they had a much better quality of life. Although modest in absolute terms, such a significant improvement in survival had never been seen before in pancreatic cancer. In 2004, while the world was weeping over the final episode of US sitcom Friends and witnessing Janet Jackson’s wardrobe malfunction, the final results of the ESPAC-1 trial were published. This change in mindset was widespread. Researchers started thinking about pancreatic cancer, pharmaceutical companies got interested and health services were reorganised to improve pancreatic cancer care. Things were changing for Noreen too. After the breakdown of her marriage, she was a single mum working two part-time jobs and taking the first tentative steps to rebuilding every aspect of her life. At this time she was walking several miles to one of her jobs each day, and on her walk one morning was surprised by a nauseous feeling that persisted over the next few days. She felt grey and exhausted and, alarmed by the green and greasy look of her stools, decided to go to the doctor. Blood tests revealed that all was not well. A GP friend suggested that she should go straight to hospital for further tests. Things moved very quickly from there and after revealing that she had a tumour in her pancreas, Noreen underwent an operation to remove it. Here is where our two stories collide. Following her surgery, Noreen was asked by her oncologist if she’d be willing to take part in a clinical trial. Noreen was enrolled on the ESPAC-4 trial, also led by John and funded by us, which was testing whether combinations of different drugs during chemotherapy could improve patient survival. Taking her friend’s advice, Noreen ticked off every chemo session on her calendar with a coloured marker pen, and gradually saw the light at the end of the tunnel. And so we bring our story right up to the present. ESPAC-4 has just finished, and John and his colleagues are now carefully analysing the data collected from Noreen and hundreds of other patients. It’s been three years since her diagnosis and Noreen is doing well. She has an important message, one that we are heeding in the future direction of our research. “I would urge that more funds be made available for research like this, to bring pancreatic cancer out of the shade,” she says. We couldn’t agree more – which is why we’re particularly focusing on pancreatic cancer as part of our new research strategy. And although pancreatic cancer remains an extremely tough-to-treat disease we now know much more about its weak points. For those eligible for surgery we know that chemotherapy can increase survival and quality of life. Work since ESPAC-1 has helped us narrow down exactly which drugs work best and how to give them for maximum effect. Writing has been an important way for Noreen to capture this new way of seeing the world, including her stories about Mr Tilly the helpful pug. With four books published and more on the way, Noreen sees this as her legacy for her grandchildren. John is also looking to the future – a future in which we are able to do large trials, like the ESPAC studies, much more efficiently and quickly, ultimately buying more time for patients who desperately need it. Another Cancer Research UK trial, ESPAC-5, has just started. It will test whether we can increase survival by giving chemotherapy before surgery, in the hope of shrinking pancreatic tumours. This could make surgery an option for those people who wouldn’t otherwise be able to have it. But we are acutely aware there is still so much to do. For patients with inoperable pancreatic cancer there are still very few options, and survival from the disease still trails well behind many other cancers. Even with the positive results from the ESPAC studies, progress is coming in achingly small steps. But that’s because it’s starting from so far behind. In relative terms, though, short-term survival has increased by around 60 per cent since the late 1980s – one in five patients now survives the disease for a year or more. But only one in every 100 patients will survive the disease for 10 years or more – a tiny number that hasn’t changed since the 90s. With short term survival increasing we’ve made small but important steps in the right direction, but it’s not good enough. That’s why we’re pledging to do more. We know that great successes are born out of many steps in the right direction, and as the pace gathers in the global research community, we hope that progress will accelerate. Thanks to the ESPAC trials, and dedicated work by our scientists and others around the world, we are now shining a light on pancreatic cancer research. Our story doesn’t have an end because our journey is not yet complete. We want many more people like Noreen to look forward to a future with their families. And although the road is long and hard, there are no short cuts. We must all walk it together, and one day we will get there. With special thanks to Noreen for sharing her story with us, and we look forward to Mr Tilly’s next adventure. On Sunday July 20th Race for Life Lancaster was held at the University of Lancaster, and the 1000 participants were set on their way by Professor Amanda Chetwyn, Pro Vice Chancellor for Colleges and the Student Experience. Those running raised over £50, 000 for Cancer Research UK, The Bay Radio who have been long term supporters of Race in Lancaster, interviewed runners and took their requests, to broadcast all over the bay area. It's a tough hilly course at Lancaster, the Leading Lady Laura, came in at 23minutes 25 seconds, Laura was running for her cousin Lou Lou, who died from cancer aged 3 years. On Saturday July 5th, sixth form students from Merchant Taylor's school organised a Pop Up Party in a shop in Crosby Village. Art work was on sale, along with games with prizes. Many children visited while out shopping, to have their face painted, try their luck at Hook a Duck and the huge tombola. Sefton Park hosted a weekend of Race for Life Events, over the weekend of July 5-6th. The 10k race on the Saturday saw 1000 ladies in pink take to the course. Sunday the 5 and 10k Races exceeded their targets, with 3500 participants, of all ages and abilities, raising over £200,000 for Cancer Research UK. On stage to warm everyone up was fitness instructor Jennifer who lead everyone in the 'Cancer Slam' The Heaton Fundraising comittee were out selling flowers, as were the Bold Street shop staff, collecting donation bags, and signing up those donating to gift aid. One of the youngest racers was just 10 months old and came in at just over an hour. Following an afternoon of rain on Saturday, the sun made a late appearance at Haydock Race Course for the Race for Life on Sunday July 13th. The course started at the event arena, close to the large pond in the middle of the race course taking runners all around the course, and through the stalls. Participants raised £140,000 for Cancer Research UK, thanks to the hard work of Event Manager Maria, and her team of volunteers. Whitchurch Rugby club donated the use of their club to host the 2nd Whitchurch Relay for Life, over the weekend of June 28-29th. Relay is a walking overnight fundraiser to recognise that cancer never sleeps, honouring cancer survivors, and celebrating life. The fundraising committee have built on last year’s success, and this year 19 teams completed the relay. The Relay ribbon was cut by Erin, aged 3 currently being treated for cancer, the cancer survivors were led by a piper to complete the first lap, before the teams took to the track for the Themed Fancy Dress Lap. Relay is a fun day out for all the family, many teams were raising more funds with activity and table top sales. Survivors and their carers were welcomed with a lunch, where they shared stories and survivors cake. The afternoon activities included a dog show, and children’s games before the evening candle of hope ceremony, where Candle of Hope Bags were placed around the track. Sunday morning bought better weather than the teams had endured for all of Saturday, and the event united the Whitchurch community in a fantastic fundraising effort. This Sunday there were Race for Life events at Tatton Park and Wigan Haigh Hall Country Park, the Wigan Race was full to capacity with over 1500 participants. Haigh Hall is the backdrop to the event arena at Wigan, the 5k Race passes the miniature railway and beyond into the surrounding woodland. Wigan has an active Cancer Research UK Fundraising Group, who were out selling pink flowers and face painting. Team ERC broke with tradition and dressed in green for the race, running in memory of Ethan Caunce, who died in April, after some treatment for medulloblastoma, which sadly had spread. Ethan was 6 years old, a pupil at Worsley Mesnes school, who’s favourite colour was green. Thank you to Ethan’s grandma for telling his story, and all the team for raising money for Cancer Research UK. Over £90,000 was raised at Southport Race for Life. The 5 and 10k race took a route round Victoria Park. After torrential rain the previous day, the course had not suffered, and the sun came out for the day. Tesco, official sponsors of Race for Life, were very well represented, a 25 strong team from all the Southport stores took part, and came with a well stocked team refreshment tent. Staff at Beales Department store, lead by Bekah from the Estee Lauder counter, took part and promoted Race for Life in store. The cosmetics team put together a large hamper of luxury perfumes and cosmetics for a raffle, they have been offering customers pink refreshments, promotional gifts, all in aid of Cancer Research UK. Bekah did really well and finished the race in just over 27 minutes. Fotis Polydoros a Statistician within the LCTU has been offered an appointment as an expert member on the Liverpool Central Research Ethics Committee. On 18th May Delamere Forest hosted a Cancer Research UK Race for Life. In the brilliant sunshine 1500 runners and walkers set off at 11am on the 5km route through the forest, there were plenty of dog walkers joining in, Mums with all terrain buggies, making the atmosphere very unique, and a lovely way to spend a Sunday morning. Heart FM kept the crowds entertained, another 850 ladies arrived for the afternoon 5k and 10k. The recently refurbished Cancer Research UK shop in Frodsham sent a team of staff with Cancer Research UK goodies, volunteers held a tombola, and sold pink flowers, all proceeds going to fund important research. Although a women only race, Race for Life would not be possible without all the many male volunteers who helped Jen the Event Manager make the day happen, volunteers from the Widnes Cancer Research UK shop processed Donation Station Bags. James a longstanding CRUK Volunteer always seen in pink, or dressed as a gorilla helped set up the course, and was on the course as a Race Marshall. Cancer Research UK’s vision is to bring forward the day when all cancers are cured. Over the last 40 years, cancer survival rates in the UK have doubled. In the 1970s just a quarter of people survived. Today that figure is half. Their ambition is to accelerate progress and see three-quarters of patients surviving the disease within the next 20 years. New pages have been launched to accompany the new strategy. A link to this page is shown below. Professor Norman Williams, the President of the Royal College of Surgeons (England) will be visiting the North West Surgical Cancer Trials Unit (NWSTC) on the 20th May 2014, following on from its successful launch in September 2013 at Haydock Park. Professor Norman Williams is a Consultant colorectal surgeon and became College President in July 2011. He is Professor of Surgery and Director of Innovation at the Academic Surgical Unit of Barts and The London, Queen Mary’s School of Medicine and Dentistry and National Centre for Bowel Research and Surgical Innovation. The NWSTC is one of five surgical trials units which have been funded by the RCS and other partners. It is a joint collaboration between the Universities of Liverpool and Manchester and is embedded within the existing Liverpool Cancer Trial Unit, based in the Waterhouse Building. The aim of the surgical trials units is to enable surgeons to deliver clinical studies to assess new surgical techniques, and develop breakthroughs in treatment that will help to deliver new and better care to thousands of patients. For further details of the visit please contact Gemma Nanson. The programme of promotional launches for Race for Life continue around the North West, where the races are well supported events run by women, many of whom have survived cancer, or have cared for a relative with cancer, new runners or walkers are always welcome to take part. The Mayor of St Helen's came along to the Haydock launch in Church Square St Helen's where despite the rain the dancers took to the floor to perform the Cancer Slam. The Blackpool Race takes place on a Wednesday evening along the Prom. Blackpool Zoo kindly allowed the Race for Life Team launch the race in the Zoo during the busy Easter holiday period. Cancer Research UK’s Race for Life is a series of 5k or 10k women-only fundraising events, which are raising money for cancer research. There are 300 events nationwide, and 2014 marks the 20th anniversary of Race for Life. Launch events to encourage participants to sign up are taking place all over the North West, it is a women only event, however men are encouraged to be involved by volunteering at an event, sponsoring and supporting women taking part. On Saturday 29th March the launch in Liverpool City Centre took place, with fairground side shows and dancers performing the Cancer Slam, the warm up dance for Race for Life. Next week the Launch is in St Helen’s, and the team are expecting a visit from the Mayor. Paul Silcocks a Senior Statistician within the LCTU has become a panel member on the NIHR North West Research for Patient Benefit committee. Many congratulations to our new statisticians Rebecca & Fotis on their new MSc results – both with distinction! The North West Surgical Trials Centre is holding its launch event on Friday 20th September at Newton-le-Willows. Click Here to download a copy of the NWSTC Launch Event Flyer. The LCTU have entered a team in the CR-UK Race for Life event at Knowsley Hall on Wednesday 17th July. Please join us and show cancer who’s boss by helping raise money to fund groundbreaking research into new drugs and treatments. Please show your support as we run, walk and dance our way round the 5k course and sponsor us through our Just Giving page below - together we will bring forward the day when all cancers are cured. Thank you. Professor John Neoptolemos receives a Life Time Achievement Award. Professor John Neoptolemos, The Owen and Ellen Evans Chair of Surgery and Department of Molecular and Clinical Cancer Medicine at the University of Liverpool and Honorary Consultant Surgeon at the Royal Liverpool University Hospital. He was the original Scientific Lead for the NIHR Liverpool Pancreas Biomedical Research Unit and is the Director of the Liverpool Clinical Trials Unit which includes the Cancer Research UK Liverpool CTU and as part of the CRUK Centre, received the Freedom of the City of Liverpool in 2012. On the 28th June 2013 he received a Life Time Achievement Award from the European Pancreatic Club at its 45th Meeting in Zurich (here in the picture along with Professor Gunter Kloppel) for his achievements in pancreatic research. He has published over 450 research articles many in top Journals such as the Lancet and New England Journal of Medicine (over 19,000 research citations with an h-index=73) and has published nine books on the pancreas, pancreatitis and cancer. Previous awards include a Royal College of Surgeons of England USA travelling award (1984); Rodney Smith Prize, Pancreatic Society of Great Britain and Ireland (1987); Hunterian Professor of Surgery, Royal College of Surgeons of England (1987-88); Moynihan Travelling Fellowship, Association of Surgeons of Great Britain & Ireland (1988); Royal Society of Medicine Travelling Professor (USA) (1989) ; British Council sponsored lecture tour of Thai Medical Schools at the invitation of the Royal College of Surgeons of Thailand (1990); Honorary membership of South African Gastroenterology Society (1991); Visiting Professor, Medical School, University of Hong Kong (1994); Eybers Visiting Professor, Medical School, University of Orange Free State, South Africa (1994); Visiting Professor, Christchurch Medical School, University of Otago, New Zealand (1995); External Examiner, Chinese University of Hong Kong (1996-1997); Wilson Wang Visiting Professor, Chinese University of Hong Kong (1997); Visiting Professor, University of Singapore (1998); Visiting professor University of Heidelberg, (2002); The Hirschberg Award for Pancreatic Cancer – American Pancreatic Association (2005); Honyman Gillespie Lecture, Edinburgh, Scotland (2007); Pearce Gould Visiting Professor, UCL, London, UK (2008). Official professional positions include Council Member of the United European Gastroenterological Federation (1998-2002) and member of the Scientific Committee (2002-2009); member of the International Committee of the International Association of Pancreatology (1990 et seq) and President (2000-2002); Scientific Committee of the European Pancreatic Club (1993-94), member of Council (1995-98), Secretary (1997-2002), President (2002-2004) and Scientific Committee Representative UEGF (2002 et seq); member of the World Council of the International Hepato-Pancreato-Biliary Association (1994-98); Treasurer and Council of European Digestive Surgery (1995-2009); Committee member of the Pancreatic Society of Great Britain & Ireland (1987-90) and President (1994-95); British Society of Gastroenterology Committee member of the Pancreatic Section (1988-91) and the Surgical Section (1991-93); Committee member of the Surgical Research Society (1995-98); President of the Liverpool and North West Society of Surgeons (2006-2007). UK research positions include National Cancer Research Institute, Committee on Upper GI Cancer, Chairman for Pancreatic Cancer (1999 et seq); Medical Research Council Colorectal Cancer Committee (1990-1996); UK Pancreatic Cancer Trials Group, Chairman (1991-95); North West Regional Research and Development Biomedical Research Committee (2001-2); The Royal College of Surgeons of England (RCSEng), Advisor to Research Board (2001-2007); MRC-RCSEng Clinical Research Fellowships, Joint Panel, RCSEng representative (2001-2007); Panel of Academic Advisers for the Commonwealth Scholarship Commission (2007-2012); Cancer Research UK Science Strategy Advisory Group (2008 et seq); Member, College of Experts National Coordinating Centre for Health Technology Assessment (NCCHTA) (2008 et seq); DoH Representative, Health Innovation Challenge Fund [Department of Health and the Wellcome Trust] Funding Panel Theme 4 [Smart Surgery], (2010-2011); NIHR Doctoral Research Fellowships Panel (2011-2012); and The Irish Cooperative Oncology Research Group (ICORG), International Review Panel (2012 et seq). International research positions include European Study Group for Pancreatic Cancer (ESPAC), Co-secretary (1992 et seq); National Institutes of Health (NIH) USA, NCI Pancreatic Cancer Progress Review Group (PRG) (2000); NCI Specialized Programs of Research Excellence (SPORE) for Pancreatic Cancer (2002-3); Netherlands Organisation for Health Research and Development Referee (2002); advisor to Bundesministerium für Bildung und Forschung/Deutsche Forschungsgemeinschaft (2006 - et seq); Deutsche Krebshilfe Cancer Centres Advisory Board (2006 - et seq); AIRC – Italian Association for Cancer Research Scientific Committee; and finally Member, Scientific Research Committee of the French National Cancer Institute (2010-12). He was elected Fellow of the Academy of Medical Sciences in 2007 and has been a Professional Academy Mentor since 2010 and became a National Institute of Health (NIHR) Senior Investigator in 2011 and a member of the NHIR College of Senior Investigators. In 2012 he was made an Honorary Member of the German Society of Surgery. Cancer Research UK has opened its first shop in Liverpool City Centre, located at 10 Bold Street. Ruth Stafferton, Senior Research Nurse from the CRUK Centre, cut the ribbon to officially open the store on Friday 1st February. Emma Parr and Julie Perry from Liverpool Cancer Trials Unit also attended the opening event. The LCTU is proudly sponsoring the second Survival Analysis for Junior Researchers conference â€“ a statistics conference that gives junior researchers an opportunity to present and discuss their work and discover recent advances in the analysis of survival data. Guest talks will be given by Prof. David Collett and Dr. Paul Lambert. A group of LCTU staff will be taking part in the Yorkshire 3 peaks challenge on the 18th August 2012. The challenge involves walking Pen Y Ghent, Whernside and Ingleborough, each of which is aroung 700m each in less than 24 hours. They will be aiming to raise Â£1000 for Cancer Research UK. 2012 is the Year of Action on Cancer in Merseyside and Cheshire. The Centre/ LCTU are playing a key role in the campaign. Why not take a look at the Action on Cancer Website or follow on twitter (@ActionOnCancer). February 29th was the Cancer Research UK Liverpool Cancer Trials Unit Launch Party Opening. Special guests included; Professor Ian Greer (Executive Pro-Vice-Chancellor, University of Liverpool), Ms Kate Law (Director of Clinical Research, CancerÂ Research UK) and Professor Philip Johnson (Director of the Cancer Research UK Clinical Trials Unit, University of Birmingham). The party included presentations from Prof. Philip Johnson and Stacey Carruthers and Gemma Simpson (LCTU Trial Coordinators) followed by a tour of the LCTU offices. Lord Mayor of Liverpool Cllr Frank Prendergast paid his second visit to the Centre on 23rd January. Last year the Mayor met some of our basic scientists and visited their labs. On this occasion the Mayor visited the Clinical Researcher Facility at the Royal and met with Profs Neoptolemos, Sutton and Palmer, Dr. Syed Hussain and Senior Research Nurse Lorraine Turner. The Mayor will be presiding over our Freedom of the City ceremony on the Town Hall on 8th February. Wednesday 8th February 2012 was a momentous day for Liverpool Cancer Research UK Centre, with over 160 guests attending a special event at Liverpool Town Hall to celebrate the presentation of our Scroll of Admission to the City's Freedom Roll of Associations and Institutions. The evening began with a buffet reception; guests were welcomed by the Lord Mayor, Professor and Mrs. Neoptolemos and Dr. Harpal Kumar, Chief Executive of Cancer Research UK. Guests included doctors, nurses and scientists from the Centre, civic dignitaries, representatives of Liverpool and Everton Football clubs, cancer survivors, and supporters. Model, Echo Columnist and friend of the Centre Amanda Harrington also attended. The Lord Mayor of Liverpool, Councillor Frank Prendergast presided over he ceremony, which took place in the Council Chamber. Testimonies were given by Dr. Kumar, Prof Sir Howard Newby (University of Liverpool) Andrew Cannell (Clatterbridge Centre for Oncology), Derek Campbell (NHS Merseyside), Jon Hayes (Merseyside and Cheshire Cancer Network), Tony Bell (Royal Liverpool Hospital), patient representatives Dennis Helsby and Bernie Singleton, and Profs Dan Palmer and Paula Ghaneh spoke about the future plans for the Centre. Following presentation of the Freedom Scroll and the signing of the register, Professor Neoptolemos presented the Centre's Pledge to the City, to fight cancer through research, training cancer professionals of the future, and through working with local people to help them understand, avoid and overcome cancer. A choir of cancer survivors from Sunflowers Cancer Support Centre on Aigburth Road sang, 'Here Comes the Sun'. Following the ceremony guests attended a drinks reception hosted by Prof and Mrs. Neoptolemos at the Lady of Mann in Dale Street. Congratulations to Prof. John Neoptolemos who has had his paper, Understanding Metastasis in pancreatic cancer: a call for new clinical approaches published in Cell. - issue 20 Jan 2012. The Centre held it's first Children's University Open Day on Saturday 12th November, with families from local schools visiting cancer awareness stalls and spending time with our scientists in the labs. The children also took away information about how to support the charity through volunteering and we made over £50 on our toy and book stall. Thanks to researchers Neville Cobbe, Violaine See, Jemma Blocksidge, Joe Slupsky, Mike Davies, Silviya Balabanova, to Research Nurses Lorraine Turner, Laura Borwn, Pembe Yesildag and Helen Jeffrey and to Tom Kearns, Gemma Barnett and Kathryn Marley from LCTU. This week sees the return of the NCRI conference in Liverpool. The Centre is well represented again this year including, Prof Andy Pettitt in the Clinical Trials Showcase for the CLL206 Trial, Prof John Neoptolemos highlighting the ESPAC-3 trial in the proffered paper session, Prof John Ellershaw is hosting and presenting a session on Prognastication in advanced cancer: How and why?, and Richard Shaw is co-hosting a Head and Neck Cancer Research Workshop, not to mention numerous posters from research groups across the Institute. For up to date information on training courses run by the National Cancer Research Network please visit the NCRN training page (link below). Training courses cover a wide range of areas including GCP training, Cancer and anatomy courses and communication of Clinical trials. On Radio Merseyside's Breakfast Show this week, there has been a focus on Aintree Hospital and they have been on site each morning interviewing various staff and patients. On Saturday 17th September a group of nurses and researchers from the Royal Liverpool University Hospital will be undertaking a 55km walk to raise awareness of the Pancreatic Biomedical Research Unit at Liverpool, and to raise funds for CRUK. Taking part are Research Nurses Helen Jeffrey, Laura Brown, Lorna Fleming, Mercy Mbuyongha, Pembe Yesildag and Lorraine Turner. Also taking part are researchers Jane Armstrong and Diane Latawiec. Our supporters include David Fleming-Bird, Brian Hennie, Ann Leech, Christina Rigby and Clare Reid. Any donation you can afford will help us with our life saving work in Liverpool. If you are UK tax payer, then please remember to tick the Gift Aid box, as this increases the value of your gift at no extra cost to you. Please help us raise as much money as possible by spreading the word to your friends, colleagues and family. Together we will beat cancer. Liverpool Cancer Research UK Centre in celebration of Black History Month presents: The Story of Henrietta Lacks. Read the attached flyer for more information. On 4th October 1951 a black American woman died of cervical cancer. Her loving but impoverished family buried her in an un-marked grave. Cells taken from her body before she died would change the course of medical research forever. Charlotte begins her long journey! Charlotte has now completed 4 of her 10 Race for Lifes; Southport (34:05), Wrexham (46:39)and Wigan (23:09), Chester (22:52), Aintree (21:31), Aintree (37:15), Blackpool (21:49) and Blackpool (21:38). Also racing with Charlotte was Laura Marsh, Sarah Jones and Lynn Edwards. Charlotte's estimated time to complete all ten races is now 4 hours 45 minutes. (people taking part in the "time" sweepstake will be keen to keep an eye on this average time!). Her next 2 races will be Aintree. Liverpool's Superlambanana has been painted bright pink to promote Cancer Research UK's Race for Life. Logos have also been added for the Race for Life and also for the Liverpool Cancer Trials Unit. Several members of the LCTU are running the Race for Life and earlier this week had a photoshoot in front of the statue. These pictures can be seen in some local papers - see links below for details. Pictures were also taken of Charlotte Rawcliffe who is bravely running 10 races across the north west! There are several Race for Lifes happening around the north west. For more information visit the link below. Liverpool Cancer Research UK Centre is hosting an open event on Wednesday 16th March 2011 between 2 and 4 pm. This event is for anyone interesting in finding out more, or getting involved in, cancer treatment, trials and support services in Liverpool. We are looking for people who have experience of cancer to sign up to our new Buddy Scheme. We are also looking for people to join the steering groups of Liverpool Cancer Trials Unit, Liverpool Experimental Cancer Medicine Centre and Liverpool Cancer Research UK Centre. The afternoon includes the chance to meet some of our scientists, doctors and nurses, and to have a look behind the scenes in one of our laboratories. More info Contact emma.squibb@cancer.org.uk or call 0151 794 8823 to confirm your place. Case Notes is a medical programme on BBC Radio 4 exploring a different topic each week, with reports and input from experts. This week Case Notes explores why Pancreatic Caner remains so difficult to treat. Every year about 8000 people in the UK are diagnosed with pancreatic cancer and the five year survival rate remains depressingly low. Dr Mark Porter investigates. The programme will be on BBC Radio 4, February 15th at 9pm. Deputy Operational Director of Liverpool Cancer Trials Unit, Charlotte Rawcliffe will be running an incredible ten Race for Life events (that's 50k) this summer, to raise funds for CRUK. Charlotte will be running at events in Merseyside, Cheshire and North Wales and would like a member (or members) of staff to run with her at each event. You can show your support by sponsoring Charlotte on her Just Giving page. Each year, around 7,800 people in the UK are diagnosed with pancreatic cancer. Sadly, the disease is difficult to treat and survival rates are poor. We urgently need to find better treatments for pancreatic cancer to help beat the disease. Use of gemcitabine, a drug that can be effective in treating advanced and resected pancreatic cancer, did not result in improved overall survival after pancreatic cancer resection (surgical removal) compared to patients who received fluorouracil and folinic acid, another treatment regimen that has shown effectiveness, according to a study in the September 8 issue of JAMA. “Pancreatic cancer is one of the major causes of cancer death globally, with a 5-year survival rate of less than 5 percent. The outlook for those patients who can undergo surgical resection is better, and in specialized centers, resection rates greater than 15 percent can be achieved. Although surgery cannot guarantee a cure, the 5-year survival does improve to around 10 percent following resection. There is a clear need to improve long-term survival in these patients,” the authors write. John P. Neoptolemos, M.D., of the University of Liverpool, U.K., and colleagues conducted a study to determine whether fluorouracil or gemcitabine is superior in terms of overall survival as adjuvant (supplemental) chemotherapy treatment following resection of pancreatic cancer. The European Study Group for Pancreatic Cancer (ESPAC)-3 trial was conducted in 159 pancreatic cancer centers in Europe, Australasia, Japan, and Canada. Included in ESPAC-3 version 2 (the trial was modified) were 1,088 patients with pancreatic ductal adenocarcinoma who had undergone cancer resection; patients were randomized between July 2000 and January 2007 and underwent at least 2 years of follow-up. Patients received either fluorouracil plus folinic acid (leucovorin, an active metabolite of folic acid, which counteracts some of the toxic effects of some chemotherapy drugs) (n = 551) or gemcitabine (n = 537) for 6 months. During the trial, 753 patients (69 percent) had died at the time of analysis (388 [70 percent] in the fluorouracil plus folinic acid group and 365 [68 percent] in the gemcitabine group). Median (midpoint) length of follow-up of 335 living patients was 34.2 months, equal across treatment groups. Overall, 282 of patients remaining alive (84 percent) had undergone follow-up for more than 2 years. Median survival for patients treated with fluorouracil plus folinic acid was 23.0 months and for patients treated with gemcitabine was 23.6 months. Estimates of survival at 12 and 24 months were 78.5 percent and 48.1 percent, respectively, for the fluorouracil plus folinic acid group and 80.1 percent and 49.1 percent for the gemcitabine group. Analysis indicated no statistically significant difference in survival estimates between the treatment groups. “Seventy-seven patients (14 percent) receiving fluorouracil plus folinic acid had 97 treatment-related serious adverse events, compared with 40 patients (7.5 percent) receiving gemcitabine, who had 52 events. There were no significant differences in either progression-free survival or global quality-of-life scores between the treatment groups,” the authors write. Members of the Egerton School of Theatre Dance visited the Centre for a Lab Tour on Thursday 15th July. The group raised £2,200 for Cancer Research UK with a musical and dance extravaganza. The group met with Professor Ross Sibson, Professor Neoptolemos, and members of Professor Barr's Group. LEAD Manager Emma Squibb, Alan English of Liverpool Cancer Trials Unit and fundraiser Bernie Singleton represented the Centre at Liverpool Carer's Day today. Around 1,000 people attended the event at St. George's Hall. Lady Mayoress of Liverpool Hazel Williams stopped at our stall and wished us well in our work. Our stall received a great many visitors, where we were able to tell people about the work of the Centre, hand out leaflets and posters, and Bernie collected on behalf of Cancer Research UK. In May, the Pancreas Club held its 44th annual meeting. Douglas B. Evans, MD, from Medical College of Wisconsin presents Adjuvant Therapy for Pancreatic Cancer: Is there a role for radiation therapy? On 14th April three members of the LCTU (Seema Chauhan, Charlotte Rawcliffe and Sarah Jones) took part in the Cancer Research UK Shine walk around Manchester City Centre, raising over £2000 between them. Alison Scott, Principal Physicist at Clatterbridge Centre for Oncology, was recently awarded the Presidents prize at the IPEM (Institute of Physics and Engineering in Medicine) MPEC conference for her presentation on “Modelling and measuring small radiotherapy photon fields”. Alison has been using Monte Carlo modelling to examine the way small photon fields differ from the larger (>3 cm) fields use more commonly for radiotherapy. These small fields are being used in more centres to treat tiny lesions in the brain and also as part of a composite intensity modulated field which aims to treat the tumour to a high dose whilst sparing abutting organs at risk. Alison presented work on the variation with density of detector response for very small fields at both the ESTRO conference (where her paper was selected as one of the highlights of the Tuesday) and at The IPEM (Institute of Physics and Engineering in Medicine) MPEC conference, where her presentation was awarded the Presidents prize. Professor Francis Barr, NWCRF Chair of Molecular Oncology at the University of Liverpool Cancer Research Centre is one of ten CR-UK-funded scientists to be elected to the European Molecular Biology Organisation (EMBO). EMBO is a prestigious body that promotes excellence in molecular life sciences that recognises and promotes internationally renowned leading life scientists. Professor Barr is one of 66 leading life scientists who have been awarded membership of EMBO this year. They join a select group of 1,420 of the world’s most prominent molecular biologists. This award is a further indication of the excellence of the work carried out by the Liverpool CR-UK Centre which will further serve to promote awareness of Cancer Research within the region, nationally and internationally.